Ladies and Gentlemen I would like to introduce you to the weirdest and most amazing bottle of Whisky I’ve discovered on this journey of writing these reviews. Alberta Rye Whisky - Dark Batch is sincerely the weirdest whisky I have ever tasted. So the trick behind this whisky is their signature blend of Rye, Bourbon, and for the weird one - Sherry. As their website goes on to explain it’s 91% Rye, 8% Bourbon, and 1% Sherry. So why is it so weird? Well for one, I’ve never had Rye with Sherry blended in before, but the amazing part is that to me it smells kind of like Rye, tastes kind of like a really smooth Rye/Bourbon Blend, but finishes like Sherry. It comes out of Canada from Alberta Distilleries (subsidiary of Beam-Suntory) and these guys have figured out something really cool. This stuff is quirky and delicious. I’m more than happy to shell out 30 bucks for this one. The price matches it’s obscurity and quality. Yeah this whisky earned the 1. I tried it in all combinations of 1-3 and adding water in any way ruins this whisky. When I first tried it I threw in about 3 ice cubes. I thought it was pretty bad and was expecting to give it a negative review. Then I thought, well try it with only 1 ice cube. It was better. So I figured the ice was the problem, I tried it on the whisky stones (as seen above in the picture) and it was great. With this kind of improvement I figured I needed to try it without the stones and it was even great then. So this is definitely a whisky to order neat. 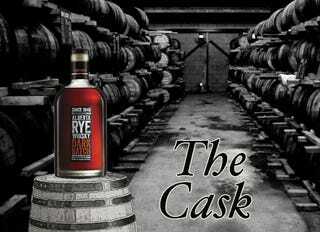 I 100% encourage you to try and find a bottle of Alberta Rye Whisky - Dark Batch and give it a try! As always let me know what you think, what you want me to drink, and what you’ve been drinking! Have a great weekend everyone! Enjoy some whiskey!